Raining and raining here -the backyard is flooded and Brisbane has been declared a natural disaster zone. I'm mostly concerned with how to keep the children entertained. If they were older I would declare natural disaster days as video-and-cooking days. 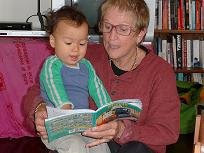 As you can see from the photo, today Granny helped out with some extended reading but I don't know how many days of that the babies will bear. Lately I'm feeling a little homesick and anxious about my ageing father in Melbourne. Careerwise, we'd be foolish to move, and Brisbane life is easy - small city, good networks, pretty parks. However I worry about Dad. When I left Melbourne he was in his mid sixties, still working...now he's in his early seventies and clearly old. Change happens quite fast, at both ends of life. How do others manage long distance families as parents age? Will I regret it, if we don't move back? My parents-out-of-law live on the other side of the world and that's increasingly hard. I think it would have been good if they'd come to live here 10 years ago. Wouldn't you be leaving Granny behind if you went to melbourne? Any chance your father would move north? He might like some encouragement. Mum has only moved north temporarily; she's planning on going back at the end of the year. I don't know that dad would move. He has a very strong community down there. I'll ask though. Even coming north for winter might be possible. This situation is really difficult. After being a carer for my elderly father in Melb for a number of years, I moved to Brisbane and travelled to visit him every few months. After 2.5 years I moved back, for amongst other reasons, to be closer to him and help my sister with his care. He's now in a nursing home and yes sometimes I wish I was still in Qld but I'm also glad I can share this end of his life with him. Everyone's different and there's always a fair degree of guilt involved. Maybe just make those phone calls a bit more regularly and try and get down to see him a bit more. Sometimes you can only do what you can do.